The wait is finally over: YouTube (s GOOG) started rolling out an app for the PS3 (s SNE) Tuesday morning, and owners of the game console who live in North America will be able to download the app through the Playstation 3 store right away. So what does the new app have to offer, aside from a pretty slick UI? First of all, personalization: You’ll be able to log in using your YouTube credentials and then access your subscriptions, watch list, recommendations, uploads and more. And you’ll also be able to use your phone or tablet as a remote control, flinging content to the screen after a simple authentication. This type of second-screen action currently only works with Android mobile devices. But, with the recent news that Google is building its own iOS YouTube app, one shouldn’t be too surprised to see similar functionality coming to iPhones and iPads as well. How do I change the language back to english it changed to russian some how?? it works except i have big lag when i watch video?? how can i repair that? Tried this app out last nite, and I must say it’s pretty sick! I love the fact that I can use Tubemate on my Android device to play video’s on my TV. My biggest rave is HD finally, I can finally watch youtube in all it’s glory on my HDTV! 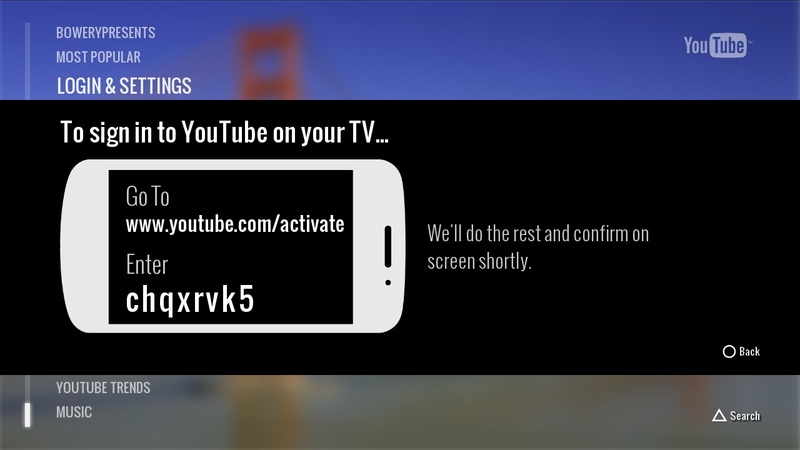 If you have a PS3 and internet, this is the best way to check out youtube. Ok I have PS3 and internet. Others do too apparently. Tell us how you did it. Complete P.O.S. Right off the bat, I keep getting playback errors for every video I try to watch using this app. Nice work…instead of an upgrade, I get no You Tube at all. I was just using it and i am confused. What exactly was wrong with either youtubeXL or youtube.com on the web browser, and why canâ€™t I get to youtube.com on the web browser anymore? This version of youtube is very irritating and does not allow for half the search and save options the other forms allow. Additionally the playback is slow and choppy, unless I plug in the Ethernet cable into the playstation. If they decide to keep this going at least allow everyone the opportunity to use youtube on the web browser. Since the new app I have not been able to login or share any videos…does anybody know how to at least share videos????? is it possible to view HD video playback in this app ? At least I now know I’m not the only one who can’t sign in. what a bunch of crap ….. you think they would have tested it first …. the only thing they do wright is to make a lot of people mad ….. I totally agree with TERRY! I have repeatedly gone through the signing in process and still can’t access my account. Any suggestions from any one out there. If anyone has a solution to this problem, could you please be so kind as to email me your response as I a not a member of this forum. With all respect, I hate it. It’s quirky, slow, and much worse than running the ORIGIONAL youtube on the ps3 browser, but you can acess it anymore, no thanks to youtube or ps3 from me. At least lets us still acess youtube, and no youtubeXL crap. I HAVE DOWNLOADED THIS APP & I TRIED TO LOG IN TO MY YOUTUBE & IT SAID GO TO YOUTUBE.COM/ACTIVATE & ENTER THE CODE & I DID BUT STILL CANT SIGHN IN……. I don’t see the app anywhere on my ps3. Is it out now or later today with the store update? Look under TV/Video services, where you would see Netflix.